Ok, so maybe I couldn’t actually squeeze his n hers sinks into my bathroom but this would be an absolute dream. I love a hotel room with his n hers sinks and it’s nice for brushing your teeth together in the morning and at night time! At my mum and dad’s house they’ve got a really big shower that goes across the whole of one wall. The shower in my en-suite is quite small and so you do end up knocking over your shampoo as your twist and turn round…and don’t even talk to me about shaving your legs in there! I’d love a huge walk-in shower – like these ones – so there’s plenty of room for all my products! To be fair I quite like the current colour scheme in my bathroom which is grey and white – I have little mosaic tiles that are different shades of grey. 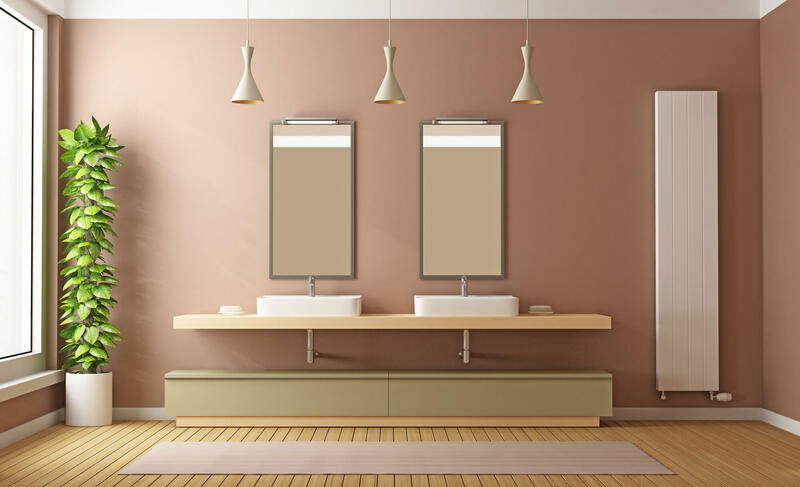 I would definitely keep my dream bathroom light shades to maximise the space and keep it light and airy. My whole apartment is painted cream and I like the way the decor runs into each room. So this might be a bit 90s but I’d love a jacuzzi bath! My wonderful boyfriend ran a bubble bath for me just this morning and there is nothing more relaxing than laying in a bath jam-packed full of bubbles. What would be in your dream bathroom? Let me know in the comments!